• How the design team engages stakeholders in the total project process so that the outcome is informed from the ground up. How does it work? The SEED Evaluator offers a guided approach broken down into practical steps in phases—Part 1, 2, and 3—that correlate to project conception, iterative development, SEED® Evaluator 3.0 Instructional Overview 2 and outcomes. Exemplary evidence within the three parts of the SEED Evaluator can lead to a project being awarded SEED Certification. SEED Certification is the standard teams and communities seek when addressing complex issues and especially those of social equity. A tool easily adaptable to teams across the spectrum of design practice, the SEED Evaluator promotes examination of project viability through each phase of development while keeping an eye to a bottom-up approach that activates community concerns though engagement. Regardless of what specific strategies are used (many of which can be adopted from the participation tactics list on pages 322–5 in the Public Interest Design Practice Guidebook), collaboration as a mechanism for research should be embedded within the public interest designer’s process. Research conducted through a framework of extended engagement reasserts the need to understand the impact of the work in various phases of implementation. Performance measurement and documentation gathered through a defined research process, which includes qualitative and quantitative methods, supports this goal.Qualitative research helps define the nature of a design problem and is open to descriptive variables that may be subjective. Research methods can include observations and flexible or semi-structured interviews—the format for recording information can involve audio, visual, and written documentation (e.g., field notes, visual mapping, sound or photographic recordings, to name a few). Quantitative research is not very flexible, as it relies on collected data to establish meaningful connections through numeric-assessment methods provided in predetermined controls. 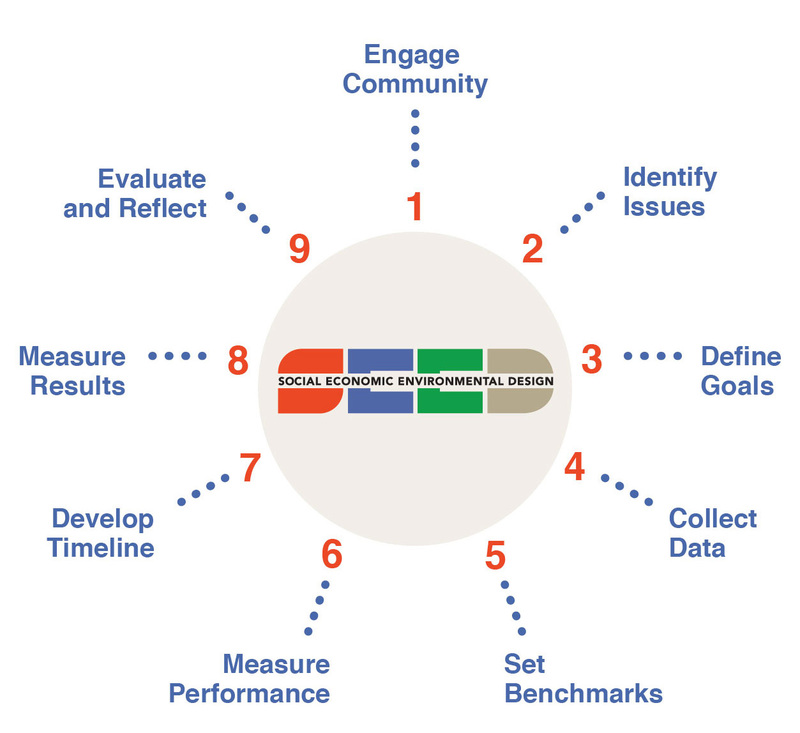 Patterns, categorizations, and statistical outcomes are typical results, which can be used to help answer questions.The SEED process supports a balanced and informed research and data-collection process in order to reveal community voice through collaboration. The method used and the data gathered, as well as participating individuals or groups, should be clearly documented so that community or audience context is understood by all involved in the project. Research does not need to be logistically difficult, expensive, or time consuming; however, research supports the understanding of the nature or context of the problem and thereby provides a platform on which to build collaboration. Stakeholder observations, discussion groups, and informal community gatherings can qualify as forms of research, so consider the possible scope of relevant methods.